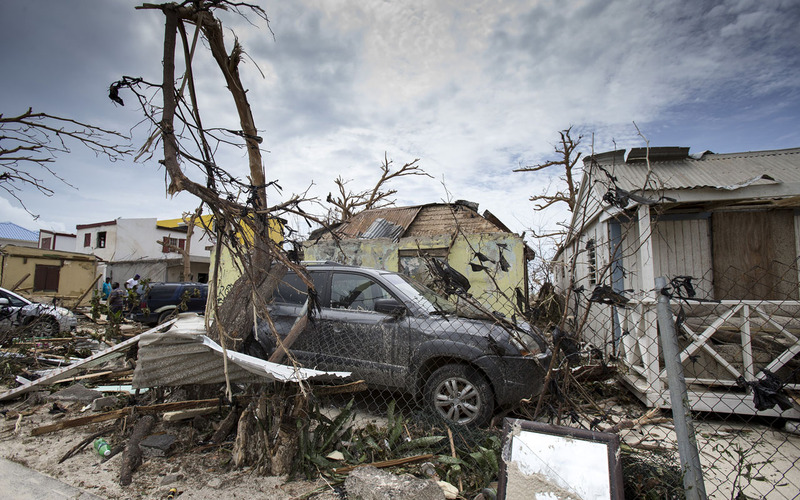 This handout photograph provided courtesy of the Dutch Department of Defense on September 7, 2017 shows houses and cars damaged after the passage of Hurricane Irma on the Dutch Caribbean island of Sint Maarten. Jennifer Lawrence had her own interpretation, blaming it all, perhaps predictably, on Donald Trump. What’s happening, she claimed, is that these disasters are “nature’s wrath on Americans for voting for Trump.” Clearly, it’s not her intellect that has made her the world’s best-paid actress! According to the Conservative Tribune, actress Alyssa Milano (“Who’s the Boss?” “Melrose Place”) joined the ranks of liberals mocking Trump’s response to Harvey in a tweet that mocked the President’s call for a National Day of Prayer on Sunday. This morning it became clear that FEMA, the government agency that oversees disaster relief, does not have the funds to help Florida after the second hurricane hits this weekend; it was only yesterday that Congress voted aid for Texas after Hurricane Harvey. Meanwhile, Islamic Relief Worldwide has been given over $700, 000 by Congress and is expected to receive more. There’s also the 800,000 young people who entered the US illegally during the last administration – the cost of housing, schooling, and feeding them, in addition to providing them with free healthcare, must be astronomical. Add to all of this the cost of the ongoing wars in the Middle East and Afghanistan. And, following the devastating earthquake south of the border this morning, Mexico is not going to be contributing one peso to the cost of building that wall. The fact is that the US is broke. It has been for as long as anybody can remember. The national debt is over $20 trillion. One TV news report today warned that flood insurance may not pay out for a while, if at all. Scott Shellady (FBN) warned this morning that with “bonds going up in price, and interest rates” low, the economy is in trouble. He added that: “Something is fundamentally wrong” and something has to give. Stuart Varney added that something may give by Monday morning! The price of gold is also going up again while the dollar is falling, two more signs of worries in financial markets. The three hurricanes (Harvey, Irma and Jose, now forming) have certainly made financial markets jittery, although companies like Lowe’s and Home Depot are expected to do well in the recovery. There’s even a fourth hurricane, Hurricane Katia, forming over Mexico. Meanwhile, the BBC’s website reports that the Netherlands is sending more troops to St. Martin to deal with serious post-hurricane looting and a total breakdown in law and order. Although the death toll could be high this weekend, the greater long-term threat is to the economies of the countries concerned. Many smaller businesses are not likely to reopen and millions of people may move out of the affected areas, as they did in the aftermath of Katrina twelve years ago. Interestingly, Monday is the 16th anniversary of 9-11, arguably the biggest disaster of all. The country is on high alert for another possible terror attack (there have been many in Europe in recent months). A serious attack equaling 9-11 would have a further negative effect on the economy and on the morale of the people. Another historical anniversary is today – it’s exactly 117 years since the worst hurricane in American history made landfall in Galveston, killing 12,000 people. America and its neighbors need time to recuperate from the current disasters. The National Day of Prayer may help, but Americans are not inclined to repent, a prerequisite for answered prayer. The country needs to think about this passage this weekend as it observes the National Day of Prayer. The September 6 ruling, which has been hailed as a victory for European federalism, highlights the degree to which the European Union has usurped decision-making powers from its 28 member states. The ruling also showcases how the EU’s organs of jurisprudence have become politicized. Many so-called asylum seekers have refused to relocate to Central and Eastern Europe because the financial benefits there are not as generous as in France, Germany or Scandinavia. “Let us not forget that those arriving have been raised in another religion, and represent a radically different culture. Most of them are not Christians, but Muslims. This is an important question, because Europe and European identity is rooted in Christianity. Is it not worrying in itself that European Christianity is now barely able to keep Europe Christian? If we lose sight of this, the idea of Europe could become a minority interest in its own continent.” — Hungarian Prime Minister Viktor Orbán. The policy positions of Merkel and Schulz on key issues are virtually identical: Both candidates are committed to strengthening the European Union, maintaining open-door immigration policies, pursuing multiculturalism and quashing dissent from the so-called far right. Merkel and Schulz both agree that there should be no upper limit on the number of migrants entering Germany.